Having been treated to so many great games over the years, it is sometimes easy to forget the innovative hardware that is behind the interaction that lets us control the character and cars that we know and love. You see, It’s not just the games that define are adventures, but the plastic we feel in are hands, the click of a button, the tilt of an analogue stick. Every console has had its own, unique hardware that lets us convey are intentions into the games we play. 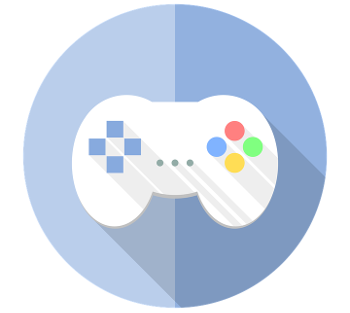 The controller becomes part of the definition of game-play. Is Mario 64 really the same game if played with a PC Xbox 360 controller? I would argue that it’s not. For it’s within the quirks of the controller and the time it takes to learn them that gives rise to a sense of mastery over game and console alike. If you take away the controller and you take away the soul from a retro gaming experience. So, if you want to have that real, full experience then you have to use a real retro controller. Read on to find out about some of the very best controllers that are SUB compatible and ready to give that authentic feeling to your retro emulation world. UP to the point of the NES console, controllers had been a bit of a, how should I put this, a bit of a messy affair. We had controllers with buttons, controllers with huge joysticks, best not to ask, and controllers with turnable nubs on them. Up to this point, console makers just couldn’t settle on a best method for offering control to their players. In stepped Nintendo, and everything changed. 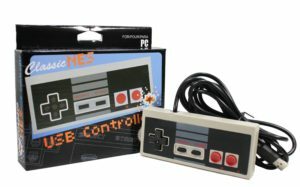 The NES controller was simple, and by simple I mean really simple. It was essentially, a small beige and black plastic box. Think of the shape of a matchstick box, then triple it in size, and then you won’t be far off. Now, place on the front a d-pad that only worked in 4 directions and 2 red face buttons for your right thumb and that’s it, that’s all you get. Just six simple buttons, I means come on, a modern PS4 controller has about 6 gazillion buttons and combinations. But no, Nintendo wanted simplicity and it was beautiful, breath-taking and it worked. This USB remake captures everything that made the original controller classic that it was 30 years ago. NO fancy plastic, no extra buttons, no software to add special features. Its just pure Nintendo, pure simplicity. So take a trip down memory lane and remember simpler gaming times, literally. I promise, you wont be disappointed. The Super NES gave rise to some of the greatest games and inventive franchises the gaming world has to offer. Mario, Zelda, Donkey ko… OK, ok, you get the gist. Anyway, In addition to its glorious software was ground-breaking hardware backing it up. 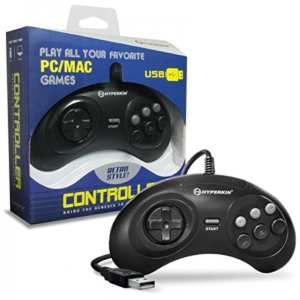 So lets take a look at this great controller and what it can do for your retro gaming. First of all, a little history. You see, when first introduced, the SNES controller really did change the game completely pardon the pun. The controller came packed with two innovations, all of which we take for granted today. The first of these innovations, which incidentally also saved us from long term arthritic problems, introduced a more rounded ergonomic shape to the controller which aided in long term gaming. The second, and my personal favourite innovation of the two, would go on to make fantastic use of all the trigger fingers of adults and children alike for generations to come: Nintendo, in their unquestionable, near god like wisdom, introduced shoulder buttons to their controller. Something that every controller has since copied. So, we can all agree that the SNES controller was great, But, does the Gtron do a good job of replicating that shapely, gray plastic feel in are hands? Having used the controller I can say, without a doubt, that Gtron have succeeded copying the SNES in every way. The D-pad feels crisp, the face buttons responsive. The shoulder buttons are just on the right side squishy so as to give good feedback. In summary, the Gtron set out to remake the SNES controller so it could be used with modern games and emulator software, and they have succeeded in every way. You see I don’t want somebody to make this controller better or change it with higher grade plastic. I want all it’s original feel and faults, and the Gtron delivers everything. 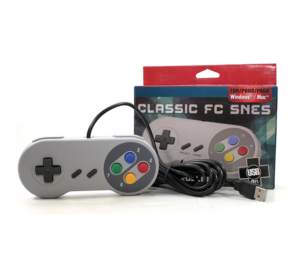 If you want a SNES controller for your PC. Stop reading, right now, and go get one. In keeping with Nintendo’s history of innovation with the SNES controller, the N64 controller took a quantum leap forward in every area of design. So lets look at how this controller shaped the gaming landscape and should be added to your retro collection today. I must admit, that I came late to the Nintendo 64 party, it was only in 2003, when doing my games degree, that I experienced the magic of Mario 64, the frenetic local multi-player of Goldeneye and the oddness but undeniable greatness of the n64 controller. The most striking change and move away from its controller for-fathers was its inclusion of a 3rd hand hold in the center of the controller. It was odd, it looked like a little space shape with a cord coming out of it. But in the middle grip was the inclusion of something very special, for the very first time, we had a thumb controlled analogy stick.Never before had this level of precision been available for gamers or game designers. The analogue stick was used well in every single game for the n64, but the early launch title Mario 64 demonstrated the true power of the move away from the digital only d-pad. In Mario 64 you could move the analogue stick all the way over and he runs but tilt it just a little way and he would walk slowly. Game changing doesn’t come close to describing how this would go on to affect the game industry. And because thumb sticks are so good at what they do, they have been included on every single controller for every single console since their introduction. Even Sony went and redesigned the PS1 controller to incorporate them! However, the innovations don’t stop there as the N64 controller was the first, with an expansion, to include a rumble feature on board the controller. Now, with the help of a rumble pack, you would not only see you have been shot on screen, you would feel that you have been shot with the controller. The rumble pack would give you a powerful jolt every time a bullet hit your digital avatar. So being such an innovative game controller it is only fitting that a remake do it justice, and this copy from Retro-Link is a perfect copy in every way. 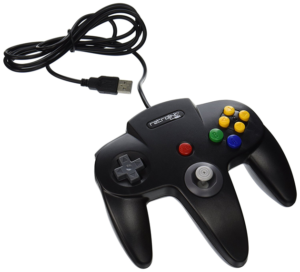 Apart from a lack of the Nintendo logo, this ‘is’ the N64 controller. From the granddaddy of analogue sticks to the perfect tension of the Z trigger, everything is present and correct. And just to add to the bargain, Retro-Link have built the rumble pack into the controller so no need to buy one separately off Ebay, just plug and play. 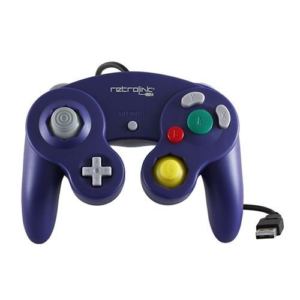 If you want that classic N64 Controller feeling. Then don’t look any further, for the Retro-Link N64 controller is going to be just the right piece of hardware for you and your retro gaming needs. I implore you, gaming friends from lands near and far, get on amazon and have a go of this gaming great today. Nintendo’s Gamecube had many great games made for it, including the greatest Star Wars game ever made, But, the console won’t be remembered for being a big purple toy box. It wont be remembered for its great games. However amazing Rogue Leader was. And, yes, it was that damn amazing. No, it will be remembered for the game controller that looked like it just came off a Hasbro toy production line. Again, almost expectantly, Nintendo broke the mould, and created a controller that delighted its users. Read on to find out why you need one of these things plugged into your PC now. It was big, it was purple, and it had loads of buttons of different sizes, colors and shapes. No, it’s not a 3 year olds play thing. It was Nintendo’s Gamecube controller. Unlike the N64 controller, there was nothing here that hadn’t been done on other controllers before, but what set this controller apart was it overall design. Nintendo want people to play with their games, literally. So they wanted a controller that simulated play, they wanted users to feel like they had a toy in there hand. Seriously, the controller would not look out of place in a push buggy. Many people used it, hated it immediately and, subsequently, didn’t bother with the Gamecube, what a mistake to make, what fools they were. For, with a little perseverance, the Gamecube controller would shine and stand, shoulders held back, head held high above it’s Xbox and PS2 counterparts. It may not have been as ergonomic and yes, the right thumb stick was just silly. But it was different in a time when every other controller was starting to homogenize. It made every game on the little purple cube feel like a unique experience. This remake by Retro-Link captures everything that made the controller both unique and maddening to use. From the beautiful click of the trigger buttons to the infuriating positioning of the tiny blue z shoulder button. Everything is as it should be. For better or for worse. But best of all, it has the same immense build quality of the original controller. You could throw it out of your pram, I mean your room, one hundred times and it would still work. A controller that dared to be different, took an age to get used to, but was worth it in every way and holds the trophy for the most bonkers looking controller ever. Games are all about playing and Nintendo created one of the most underrated, unique controllers ever. I highly doubt any company, not even Nintendo, will ever be so bold to create a controller like this again. So, I implore you, no actually I beg you, go pick one of these up. Play with it, stick with it. At first it will annoy you. Then you will scream at it. But after that, you will fall in love, and wish every controller had the charm of the Gamecube’s controller. Sega, along with Nintendo, were the big innovators in gaming in the late 80’s and 90’s. And when it came to controllers Sega refused to be left behind, coming out ahead of the SNES, the Sega needed to stay competitive and with gamers expecting ever more from their consoles, Sega was on a mission to ensure the Genesis’ controllers came with a few new tricks of there own. The genesis controller was the doorway into my childhood gaming world. Yes I was a Sega man, and yes, Sonic is better than Mario. Just accept it people. Anyway, enough about me. After the box that was the master system controller, Sega felt ergonomics was the future of console game controllers. And with that innovative attitude, Sega created a controller that was designed to sit comfortably in the hand for hours on end, without causing carpel tunnel syndrome, without any other unwanted, physical side effects. However a consequence of this struggle for ergonomic perfection led Sega to creating a controller that had more than a passing resemblance to a boomerang. Unfortunately, from doing my own personal research, I can confirm that this controller may look like a boomerang but it does not act like a boomerang. I wonder if my neighbour will ever give me back those ‘test’ controllers I flung out the window? Anyway, in keeping with its original Aussie inspired looks, the Hyperkin controllers are an exact replica in every way that matters from the shape of the controller body to the feel of the d-pad and buttons under thumb. It feels right to the touch and the weight of the controller in hand feels correct. And Hyperkin have been good enough to include 2 controllers in the pack which is great. So, if you are in desperate need of a Genesis controller, complete with original, look, feel and touch then you have found what you are looking for. Hyperkin make great retro remakes and these controllers are no exemption to their high standards. So buy with confidence.